Text: I went my first night to Fritz Lang’s Liliom, a naïve and rather moving film of heartlessness on earth and repentance in heaven. 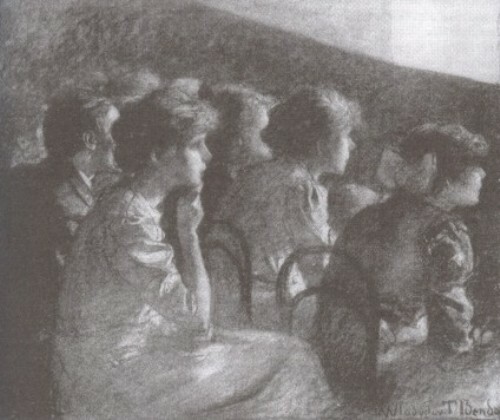 The audience were more interesting than the film; they accepted the sentiment just as any European audience would have done, but when the two messengers from God – dressed in sinister seedy clerical black – appeared beside the body and lifted Liliom’s soul between them into the sky, legs trailing like stuffed dolls through the firmament, they hooted and cat-called. Many got up and went out: they were not going to have anything to do with heaven or hell; only later, when that they found out that heaven was to be treated with whimsicality and a touch of farce, did they settle down into their seats. When I came out the streets were dark, and the air at seven thousand feet felt cold and thin and lifeless. Comments: Graham Greene (1904-1991) was a British novelist, many of whose works were filmed and who was a notable film critic in the 1930s. The Lawless Roads is an account of his visit to Mexico in 1938. Liliom (USA 1934) was based on the play by Ferenc Molnár about a fairground barker who commits suicide after taking part in a robbery. He is sent to Purgatory and then returned to earth to perform one good deed. This entry was posted in 1920s, Mexico, Travel writing and tagged Audiences, Booing, Graham Greene, Liliom (1934), Religion. Bookmark the permalink. And LILIOM was the source for Rodgers and Hammerstein’s CAROUSEL. You are correct, of course. I should have noted that.